Although 16:9 seems to be the aspect ratio of choice for most monitor making companies, there's been something of a push for 21:9. This cinema-styled ratio (which is actually a less marketable 64:27) is perfect for movies, as it eradicates the unsightly black bars movies come with on Blu-ray. Great then for cineastes, but is it really any good for everyday PC tasks? 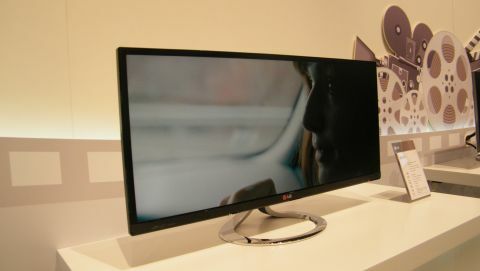 LG is hoping so, and we have to admit the LG EA93 is a beautiful piece of kit. The screen size is 29 inches, which is definitely on the large side but it makes sense when you start thinking that the monitor is essentially two monitors. In short: this IPS display ((WQHD resolution 2,560 x 1,080 pixels) comes with a lot of real estate, so you may as well make as much use of it as you can. LG is claiming that the screen can actually be split into four sections, so pretty tasty then for the multi-tasker. It also allows two portable devices to connect to the monitor simultaneously, which is a great addition. Whatever task you do decide to do on the EA93 it will look great. The monitor utilises 100 per cent of sRGB colour space and has a brightness of 300nits – this means colours ping off the screen and there's a lovely vibrancy to everything. And connectivity isn't bad either, with two HDMI ports on board, one USB 3 port, and a dual DVI-D connection. Although we couldn't crank the sound right up, the monitor also has a 7 watt stereo speaker, so movies will sound, as well, as look great. 21:9 isn't the future of monitors, but the aspect ration isn't a gimmick either - especially when it comes to the tiling structure of Windows 8. The LG EA39 proves this brilliantly and will be in the shops come October, with pricing to be announced.